Poké Pelago consists of a variety of minigame isles where Pokémon can go exploring, play on athletic equipment, and enjoy other fun activities. This feature unlocks as soon as you have access to the Poké Ride Charizard Glide, after completing Captain Kiawe's trial on Akala Island. Poké Pelago can be accessed via the menu. 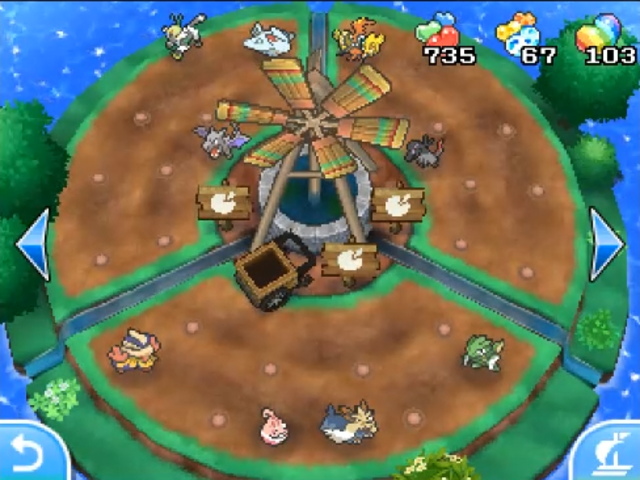 It is watched over by Mohn and consists of isles with various mini games which Pokémon deposited in PC Boxes can enjoy. 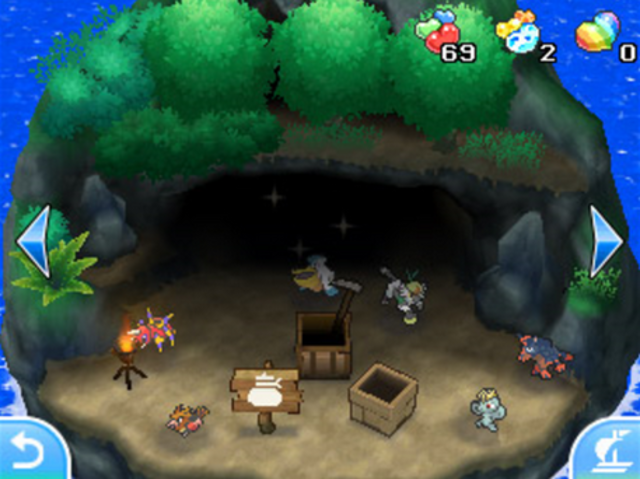 As more Pokémon are sent to Poké Pelago, more facilities and isles become available. As these isles are developed and increase in number, you’ll be able to do things like obtain items or raise your Pokémon. You can develop a total of five different islands, themselves able to reach three different levels. Each new island and development requires a certain number of Pokémon in your PC boxes and costs a certain number of Plain Beans. 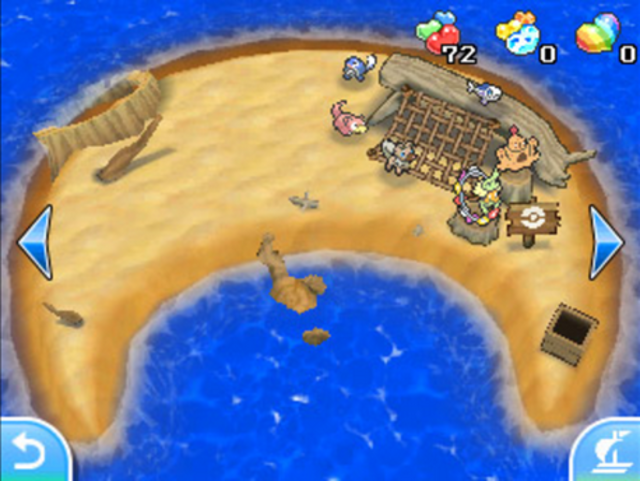 Poké Beans can be used to temporarily enhance an island's capabilities or shorten the amount of time required to complete a task, which lasts depending on how many Poké Beans are used. A Plain Bean lasts 20 minutes, a Spotted Bean 1 hour, and a Rainbow Bean 2 hours. 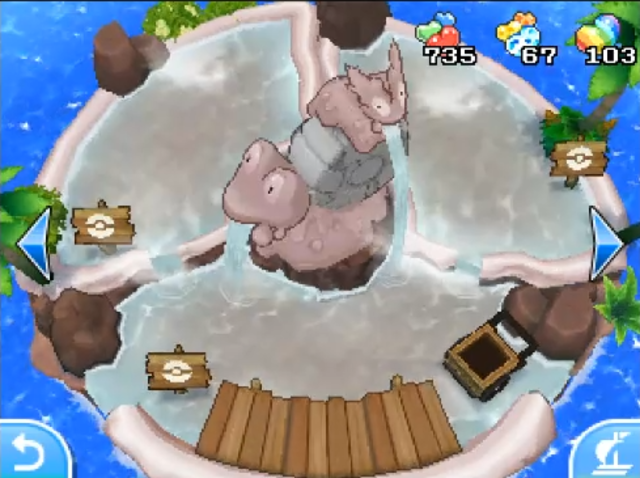 Each island has a Bean Crate where the Poké Beans can be deposited in. The amount of Beans that can be placed into the crate at the time increases with the island's level. The first level has a limit of 20 Beans, the second level has a limit of 30, and by the third level you can deposit 50 Beans. You can't add more Poké Beans until the previous supply has been used up for that area. You can exchange Patterned and Rainbow Beans with Mohn for Plain Beans. A Patterned Bean will give you 3 Plain Beans in exchange, and a Rainbow Bean will give you 7 Plain Beans. 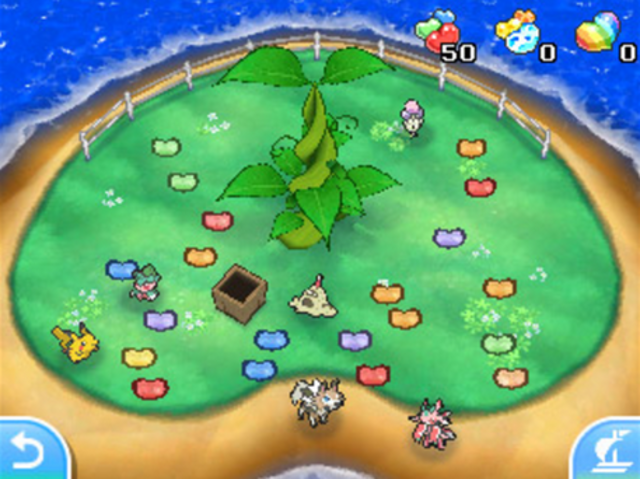 It is more efficient to trade Rainbow Beans to Mohn for Plain Beans and place them in the Bean Crate, or to feed them to Pokémon in Pokémon Refresh. A single Rainbow Bean can be traded for seven Plain Beans, but the boost one Rainbow Bean gives is only that of six Plain Beans. However, a Rainbow Bean raises more than thirty times the affection of a Plain Bean when given as food in Pokémon Refresh. When sending out a Bean Bottle, you fill a bottle with seven Poké Beans and dispatch it to a random player. You can also receive a Bean Bottle from a random player yourself. You can only send one Bean Bottle a day. Isle Abeens is available from the start. This isle features a Poké Beanstalk, which you can shake with your stylus to make it drop Poké Beans. You can then collect the Beans by tapping them with your stylus. You can also deposit Poké Beans in the crate on the isle to make wild Pokémon appear. The top screen shows which wild Pokémon are currently visiting, including their gender and nature. A Pokémon that displays a heart icon in the bubble above its head wants to join you on your adventure. If you wait too long, the wild Pokémon may leave. As you progress through the story, more wild Pokémon become available, while others will become more or less common. 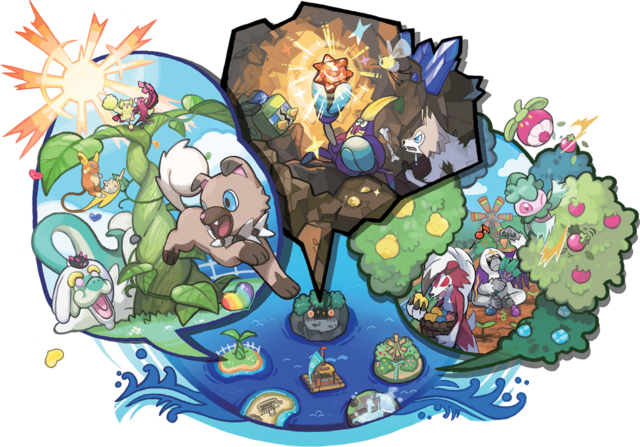 The availability of Pokémon changes when you reach Ula'ula Island, Poni Island, and when you become the Champion. Level 1: Available from the start. Level 2: Increases the harvest of Poké Beans. Available after having deposited 15 Pokémon in the PC, and costs 30 Plain Beans. Level 3: Increases the harvest of Poké Beans. Available after having deposited 30 Pokémon in the PC, and costs 90 Plain Beans. Isle Aplenny can be developed after having deposited 15 Pokémon in the PC, and costs 15 Plain Beans to develop. On this isle you can grow Berries, which are quite useful in a number of situations. It takes 24 to 72 hours for a Berry plant to grow. When you have planted at least one Berry, you can add Poké Beans to the crate on the island to make the Berrie plants grow twice as quickly and increase the yield of Berries. Level 1: Up to 6 Berries can be grown. Available from the start. Level 2: Up to 12 Berries can be grown and Berry harvest is increased. Available after having deposited 30 Pokémon in the PC, and costs 60 Plain Beans. Level 3: Up to 18 Berries can be grown and Berry harvest is increased. Available after having deposited 45 Pokémon in the PC, and costs 135 Plain Beans. Isle Aphun can be developed after having deposited 30 Pokémon in the PC, and costs 30 Plain Beans to develop. On this isle you can let your boxed Pokémon search for valuable items such as Shards and Evolutionary Stones. Tap the sign on the isle to start your Pokémon's treasure hunt. Once you start a treasure hunt, the top screen shows how much time it will take for your Pokémon to return. Deposit Poké Beans in the crate to make the treasure hunt go twice as fast. Items found will be left in the treasure crate on the island, which you can tap on to collect the items. Level 1: One path can be explored, in which various shards can be found. Available from the start. Level 2: Three paths are available for exploring, in which shards, stones, or rare items can be found. Available after having deposited 45 Pokémon in the PC, and costs 90 Plain Beans. Level 3: Four paths are available for exploring. In the new path, shards, stones, and rare items can be found. Available after having deposited 60 Pokémon in the PC, and costs 180 Plain Beans. Isle Evelup can be developed after having deposited 45 Pokémon in the PC, and costs 45 Plain Beans to develop. On this isle you can leave boxed Pokémon for EV-training. You can give your Pokémon drinks, like EV-raising drinks or Level Boost Drink. These drinks are free. By tapping on the sign you can choose which Pokémon you want to train and which kind of drink to give them. On the top screen you can see how long your Pokémon will be training. Each training session lasts 30 minutes (15 if you deposit Poké Beans in the crate). Level 1: Up to 6 Pokémon can be trained on the isle. These Pokémon gain 1 EV per session. Available from the start. Level 2: Up to 12 Pokémon can be trained on the isle, divided into two groups. These Pokémon gain 2 EVs per session. Available after having deposited 60 Pokémon in the PC, and costs 120 Plain Beans. Level 3: Up to 18 Pokémon can be trained, divided into three groups. These Pokémon gain 4 EVs per session. Available after having deposited 75 Pokémon in the PC, and costs 225 Plain Beans. Isle Avue can be developed after having deposited 60 Pokémon in the PC, and costs 60 Plain Beans to develop. On this isle your Pokémon can relax in a hot spring, which increases their friendship. However, if a Pokémon is kept in the springs for 24 hours, its friendship will begin to drop due to taking in excess heat until it is removed. You can also send Eggs to the isle to be hatched. If the Egg is ready to hatch, an exclamation mark will appear above it and you can tap it to make it hatch. Tap on the sign to choose which Pokémon or Eggs you want to send to the isle. You can deposit Poké Beans in the crate to raise friendship or hatch eggs twice as fast. Level 1: Up to 6 Pokémon/Eggs can relax/be hatched on the isle. Available from the start. Level 2: Up to 12 Pokémon/Eggs can relax/be hatched on the isle. Available after having deposited 75 Pokémon in the PC, and costs 150 Poké Beans. Level 3: Up to 18 Pokémon/Eggs can relax/be hatched on the isle. Available after having deposited 90 Pokémon in the PC, and costs 240 Poké Beans.